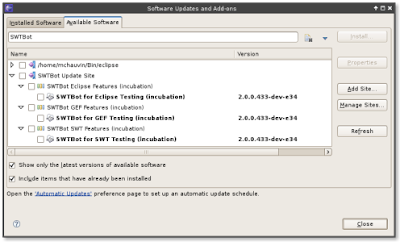 Back from ESE where I gave my presentation about GEF support in SWTBot last week, I am happy to announce that GEF feature is available in SWTBot update site. Thanks Ketan for that. Quite obviously there are several bugs opened and there is room for improvement but current API is not frozen, so it's time to test and ask for enhancements ! 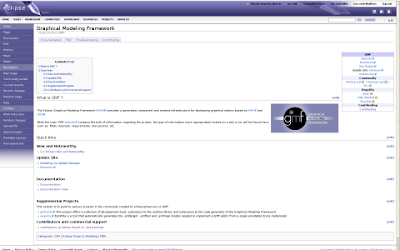 On GMF side I updated yesterday its main wiki page to use tabs. There is a lot of valuable information available on the wiki for GMF, but it was scattered. I hope you find the new page clearer and useful. Great work! I'm sure a lot of people will find this useful who build their graphical editors on top of GMF.